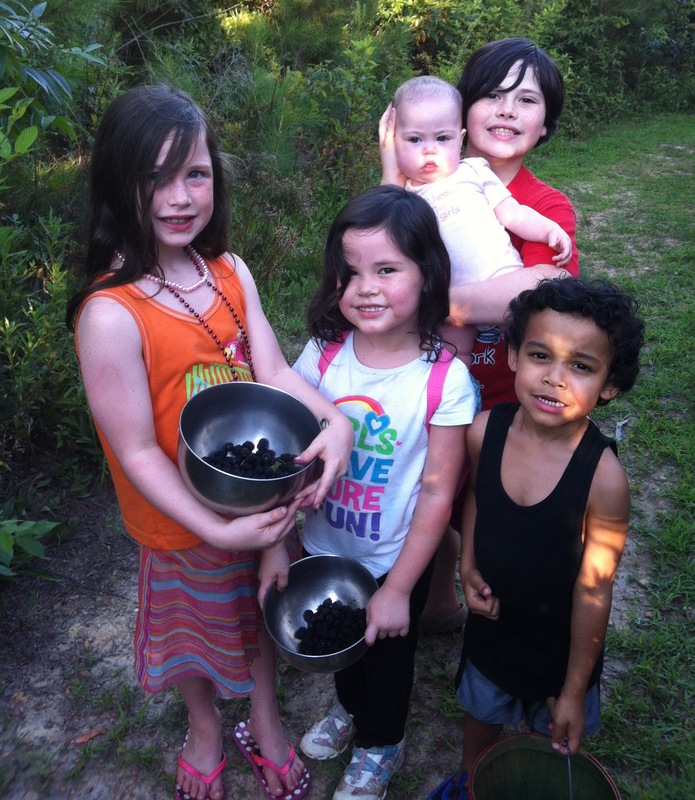 Jilda invited our great nieces and nephews over this evening to pick blackberries. They love coming to our house because they run wild back behind the house and barn. The blackberries are doing well this year because we've had enough rain to keep them baring. I got a bucket and they ran ahead. You could hear laughter and squeals echoing down the hollow. I got out earlier today and cut grass. I also took hedge clippers and clipped out places where they could reach the berries. I was surprised at how many they picked in about 45 minutes. They had enough for at least two blackberry pies. Jilda stayed behind and cooked hotdogs, baked beans, and deviled eggs. Those kids can eat their weight in deviled eggs. As we herded the kids back toward the house, the blackberry bushes looked as if a swarm of locusts had picked them bare. It's a good thing I'd already picked a couple gallons and put them up in the freezer so we can have pies throughout the summer. By the time they left, both Jilda and I both looked like we'd been rode hard, spurred deep, and put up wet. We're about to call it a night. Y'all have a happy Thursday. Once again, we are thinking along similar lines. Those look like happy kids. I'll bet the kids had the time of their lives! But I understand totally: nothing makes you more tired than keeping up with children when you're not used to it. Luckily it's great fun, so we keep doing it. I love this post, I am definitely going to try to go to our nearest berry farm to pick some myself this summer! I'm sure you guys had a great time! I enjoy reading this post and I love it. Thanks for sharing. I got something new from here. Picking blackberries is always so much fun! Great looking group of kids!